On May 8, the Wall Street Journal published a column, authored by editorial writer Allysia Finley, about our lawsuit titled "Hetch Hetchy Makes San Franciscans a Touch Tetchy". The online version of the WSJ requires a fee, but the full column has been posted by a group called "Families Protecting the Valley" (the San Joaquin Valley, that is). Principally, the column seemed to mock both Restore Hetch Hetchy and San Francisco. Ms. Finley notes that San Francisco's "liberal politicians care ... about social inequality and the environment", but are unwilling to "spread the water around." 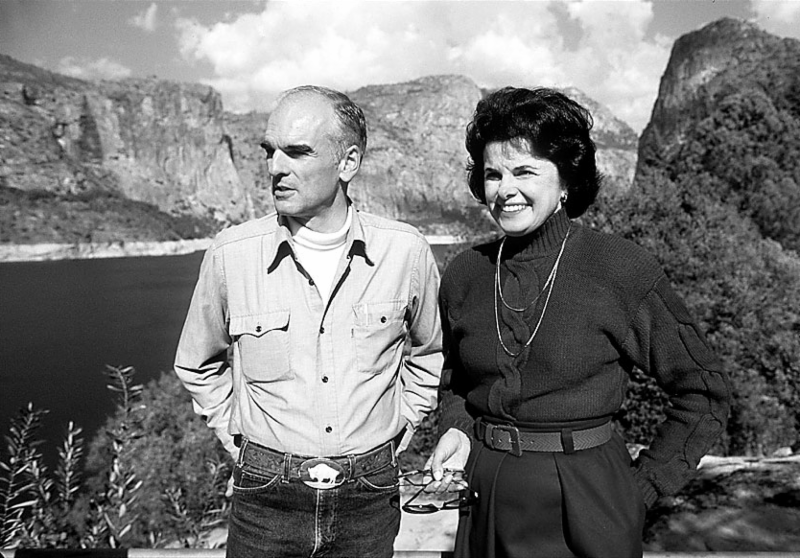 Interior Secretary Donald Hodel with then Mayor Dianne Feinstein at Hetch Hetchy in 1987. At Restore Hetch Hetchy, we are keenly aware of the political forces at play on the multitude of issues in the United States. But politics is a game we are not playing. We are a nonpartisan organization and devoted to a single issue - the restoration of Yosemite's Hetch Hetchy Valley. There may well be other incorrect political characterizations of our campaign to come. Past such incorrect assertions regarding Restore Hetch Hetchy have suggested that we are (1) a Republican plot to embarrass San Francisco, (2) part of a plot to steal water for Los Angeles and, (3) stooges for PG&E. Restore Hetch Hetchy supporters know better. So does anyone who has read the bipartisan column "Restore Yosemite? It can be done." in the Los Angeles Times or the bipartisan Foreword to the Environmental Defense Fund's Paradise Regained: Solutions for Restoring Yosemite's Hetch Hetchy Valley. Our principal objection to the Wall Street Journal column, however, is not about politics but about water supply. They assert we would create a water shortage. They ignore our commitment to fully replacing water supply and that our petition would provide adequate time for San Francisco to plan and implement system improvements before restoration takes place. Allysia Finley's column, "Hetch Hetchy Makes San Franciscans a Touch Tetchy (May 8, 2015), nicely raises the legacy of the damming of Hetch Hetchy Valley in Yosemite National Park - the one time in American history we have allowed such destruction in any of our national parks. But she incorrectly characterizes our campaign for restoration and our legal petition as threatening regional water supply. Most importantly the existing reservoir is one of nine reservoirs in San Francisco's regional water system. It is a storage tank, not a source of water. Our petition recommends San Francisco be given adequate time to make system improvements so not one drop of water is lost before restoration begins. We ask only that it be captured after it leaves Yosemite National Park. Multiple independent studies have shown this can be done. That is why many credible public officials, beginning with Don Hodel, Ronald Reagan's Secretary of the Interior, have supported restoration." Our legal case depends on convincing the courts that San Francisco's water deliveries will be kept whole. We are looking forward to presenting expert testimony to that effect.